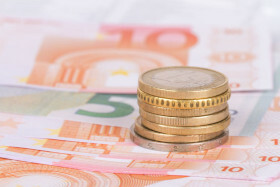 The euro today largely traded sideways against the US dollar following yesterday’s significant recovery from lows last witnessed in mid-December. However, despite the recovery, analysts are still predicting that the euro is likely to be in a bearish trend for most of January. The EUR/USD currency pair today traded in a range between a high of 1.1419 and a low of 1.1382 as markets waited for direction. The currency pair today headed lower following a deluge of mostly negative PMI releases from across the eurozone by IHS Markit. The Markit France services PMI came in at 49.0 missing expectations by 0.7, while the Markit Germany services PMI was recorded at 51.8 versus the expected 52.5. The Markit eurozone services PMI also missed expectations by coming in at 51.2 versus the expected 51.4 print. Only the Markit Italy services PMI beat expectations by a 0.4 margin. The release of the latest German unemployment change data by the Federal Statistical Office had a muted impact on the currency pair, despite the prints being within expectations. The release of the eurozone inflation data for December by Eurostat triggered a decline by the pair. The headline CPI print came in at an annualized 1.6% missing expectations by 0.2%, while the core CPI print met expectations by coming in at 1.0%. The producer price index data for November also missed expectations contributing to the decline. The currency pair’s short-term performance is set to be influenced by the release of the US non-farm payrolls data later today. The EUR/USD currency pair was trading at 1.1412 as at 11:29 GMT having rallied from a low of 1.1382. The EUR/JPY currency pair was trading at 123.22 having risen from a low of 122.63.